The election of the Rt. Rev. 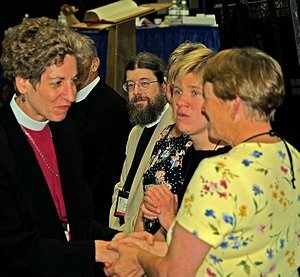 Katharine Jefferts Schori as 26th Presiding Bishop of the Episcopal Church is momentous for several reasons -- not the least of which is that many General Convention deputies, visitors and bishops themselves did not believe the House of Bishops had the moral courage to choose the obviously superior nominee. The conventional wisdom was that a "compromise" person, palatable to both sides of the church and the rest of the Anglican Communion, would be chosen in the hope that we might "get on with it" -- whatever "it" is. It has been reported that a few retired conservative bishops (as many as nine) voted for her to demonstrate the split in the American church, but that can be documented only by those who would have concocted such a self-defeating scheme. Is for men to find that door - the door to God. And opens to the man's own touch. They live on the other side of it - live because they have not found it. And want to get out. 'Let me out!' they cry. To leaving - preoccupied with the wonder of it all. But would like to run away. So for them too,I stand by the door. Where? Outside the door -Thousands of them. This poem was sent to me by my brother in Christ known on the 'Net as EastBayWill. I thank him for sharing it with me, and now you. The General Convention decisions will make it impossible for a partnered lesbian or gay priest to be consecrated a bishop and Mr Kirker says that the American Episcopalians were “coerced” into changing their stance. “Our Church does have a sickness, the sickness of institutional homophobia, but the illness has been misdiagnosed and the treatment will mortify that what is good and leave the disease untouched.” He said. But Mr Kirker believes that the plan laid out by the Archbishop of Canterbury will never be completed as other forces in the Anglican Church take control, ““We will indeed see a very different Church develop from our current divisions, but a large part of it will not be centered on Canterbury and the fall out to win unity and power will leave to those who remain with Canterbury a legacy they would not want.” He said. Mr Kirker looked back at the joy and celebration that greeted the consecration of Gene Robinson and concluded: “Lesbian and gay Anglicans are still celebrating the faith, they still celebrate their sexuality and loving partnership, they look again for another day when they are celebrated by their own Church. hearts given over to You. kairos time is upon us. as if for the very first time. SAN FRANCISCO, CA - - - By refusing to discriminate based on sexual orientation, the Diocese of Newark, NJ has broken the ‘stained glass ceiling’ some thought was recently installed to prevent LGBT clergy from becoming bishops in the Episcopal Church, the head of the Bay Area’s LGBT Episcopal ministry said today. “By nominating an openly gay priest from San Francisco as one of four candidates to become their 10th Bishop, the Diocese of Newark has reaffirmed that our church does not discriminate against LGBT people,” Oasis President Rev. John Kirkley said. Earlier today, Newark’s Standing Committee included the Very Rev. Canon Michael Barlowe, Congregational Development Officer for the Diocese of California, among candidates selected by Newark’s Search/Nominating Committee. A North Carolina native, Cannon Barlow has been partnered for 23 years with the Rev. Paul Burrows. 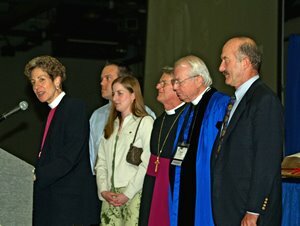 Cannon Barlow’s nomination comes on the heels of a bitterly contested resolution passed by the national Episcopal Church’s General Convention urging diocesan committees to exercise “restraint” concerning election of LGBT clergy as bishop. Just yesterday the Archbishop of Canterbury called for creation of a two-tiered Anglican Communion with national churches that welcome LGBT people holding a lesser place in that Communion. “We commend the Diocese of Newark for refusing to cave in to pressure to discriminate against nominees for bishop based on sexual orientation,” Kirkley added. 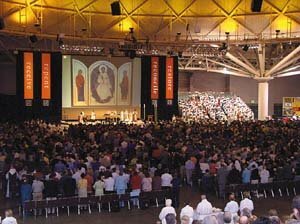 “Unlike our General Convention, the Diocese of Newark refuses to lie about the Holy Spirit’s presence in the ministries of gay and lesbian clergy. God can not and will not be restrained but continues to raise up leaders whose manner of life challenges the intolerance, bigotry, and fear now poisoning the Anglican Communion,” he added. "I am grateful to the Archbishop of Canterbury for his lengthy and careful reflection on being an Anglican today, and look forward to considering this in detail. However, I would like to stress that constant talk of schism from various quarters does not address the heart of the matter which is living with difference and otherness. It is our nature as human beings to be diverse and therefore the modern world requires the church to deal with diversity. This reflects the unity and diversity we find within the one God, Father, Son and Holy Spirit, in whose image we are created. We need to be tolerant of difference. 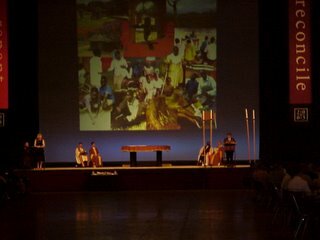 The Anglican Church in Southern Africa knows what it is to live with difference and otherness. We were born in conflict but, in spite of our problems and disagreements, we have agreed on the fundamentals and recognised that we are together despite our differences. You do not find us today divided into a black church and a white church, for example. At present there is a lack of appreciation for the governing structures of the Anglican Communion. 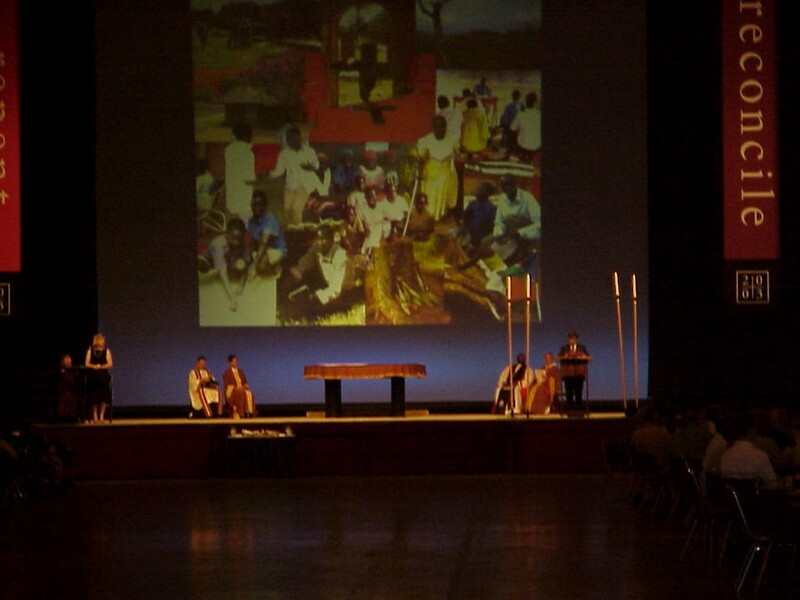 The worldwide Anglican Church is made up of autonomous provinces which make their own laws. 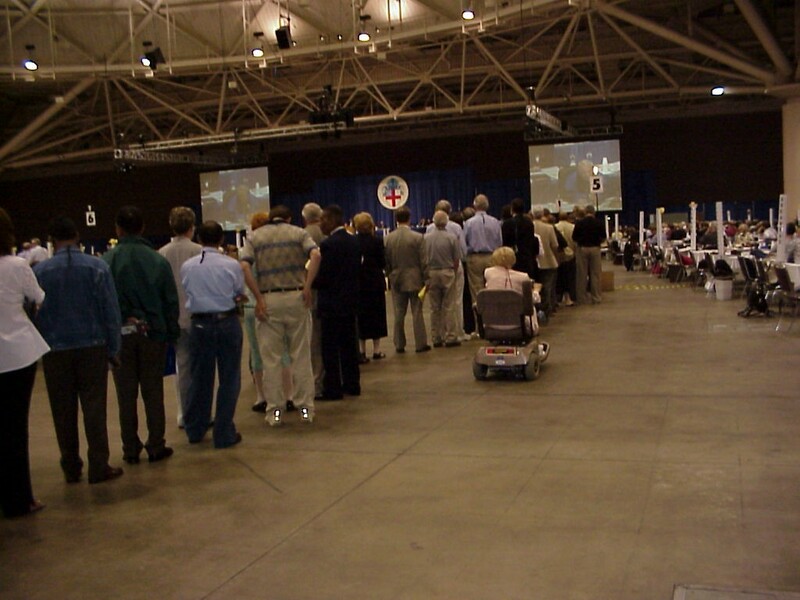 The Episcopal Church in the USA is one of the most democratic of our autonomous provinces. The Diocese of New Hampshire elected Bishop Gene Robinson democratically, according to their constitution and canons. The same can be said of the recent election of the new Presiding Bishop of the Episcopal Church, Bishop Katharine Jefferts Schori. Those elections were not illegitimate within the rules of the American church which is an orderly church – as is our church in Southern Africa. There was a clear majority in favour of both candidates. 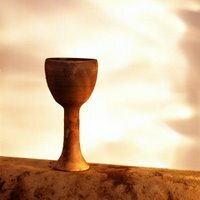 A proper understanding of how the institutional life of the Anglican Communion has served our spiritual life and ministry is fundamental to avoiding a knee-jerk resorting to talk of schism whenever any disagreements arise among us." You know, the thing we do when we aren't praying hard and things don't seem so great but then there it is! And if you are politically motivated and still an Episcopalian [now that was funny!] then you need to visit this site http://www.cafepress.com/episcopaltshirt?OVRAW=episcopal%20church%20general%20convention%20podcasts&OVKEY=episcopal%20church&OVMTC=advanced for all the Episcopally [is that a word even???] correct election goodies. That said, have fun and get a good laugh too. We need whatever it takes to get through the aftermath of Convention and the last bad piece of legislation done that last day. And we will need it in the future as our Communion either gets its act together or disassmbles completely. I pray it won't happen but if it does, then God is moving and working His will either way. I shouldn't be surprised. The LGBT in the Episcopal Church think that the world has somehow ended by the less than concrete resolution B-033. They also think that +Katharine Jefferts Schori is the enemy all of a sudden. Wrong. 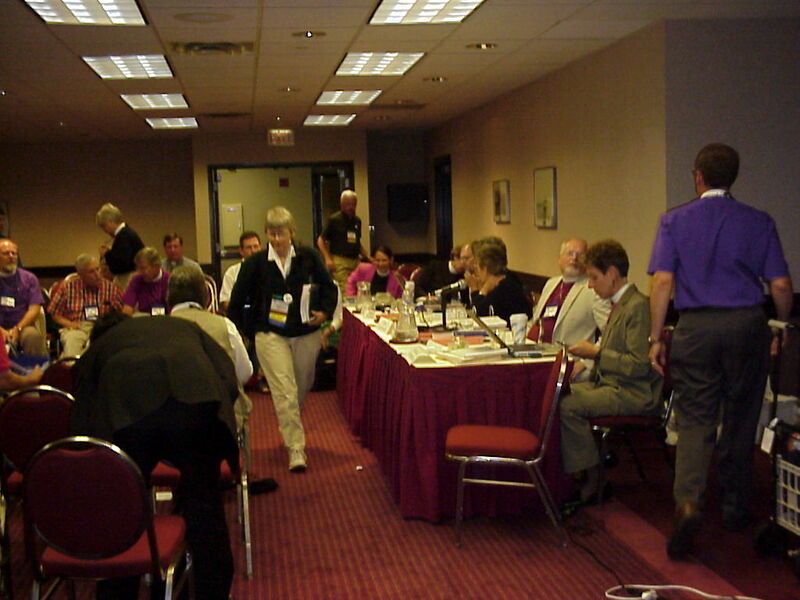 Resolution B003, "On the Election of Bishops"
Resolved, that this Convention therefore call upon Standing Committees and bishops with jurisdiction to exercise restraint by not consenting to the consecration of any candidate to the episcopate whose manner of life presents a challenge to the wider church and will lead to further strains on communion. Ok. There it is. And somewhere else it further states that the duration is for three years but that there is actually no time constraint set for the compliance of this resolution. So it asks that restraint be exercised. What exactly does that mean? The word itself is derived from "restrain" which in itself means: to hold back from action, check; suppress; curb; to keep under control; to limit. Restraint: a loss or limitation of liberty; control of emotions, impulses; show reserve. Given the immediate definition, I take it to mean that we should limit but not completely stop nominating clergy to become bishops with alleged iffy manners of life, which in reality applies to everyone because there is always some iffy thing in our lives, intended or not. Why? Because we are human. Period. They aren't talking just about LGBT people, they are talking about women as well, because we have always been a challenge to the communion and we still are. We were bold enough to tell them where to put their challenge too, when we elected +Katharine as our next PB. Every one on the planet has "a manner of life that presents a challenge" because what the challenge is, is left wide open. In other words they can name anything and call it a challenge. They may decide that wheelchairs present a challenge and stop people in wheelchairs from fully partaking of the blessings promised in our Baptismal Covenant. You get the picture. But they do not control us. The Anglican Communion's colonial attitude needs a big change and we apparently are the instrument of that change. And if there are strains on the communion, I don't feel them. Only those who wish for us to go back to the good ol' days of patriarchy and blind obedience feel the strain of change and innovation, not we who do the innovating toward a positive and fully inclusive future. Just thinking about that makes me smile. The other issue at hand is our Presiding Bishop elect, The Rt. Rev. Katharine Jefferts Schori. The people who criticize her now haven't clue one about her. They don't know for instance that she was made to listen to some phone call on ++Frank's cell while standing in a hallway among some other bishops that were siding with the current PB. I believe that pressure was put to bear on the new PB's shoulders whether she wanted it or not. The Anglicans in England have been obviously busy interfering with their former colony again. And for all we know it was the Archbishop Rowan who was on the phone and who knows what was said to her. I think it was Elizabeth Kaeton+ in her reflections who observed +Katharine walking slowly, her head hung down and her countenance one of profound sadness as she approached the podium in the House of Deputies to make the statement regarding B-033. +Katharine wasn't enjoying the moment either, people. And because of that moment, everyone is judging her infirm to do the right thing. But some of us know that her ministry in this Church began in Oregon and continues in Nevada even while she prepares to become THE Presiding Bishop five months from now, and that ministry was and will be one of building bridges and mending fences--HER way. If you really want to know what +Katharine is about, go to her diocesan web site,http://www.nvdiocese.org/BISHOPSPAGES/_BpsDir.html and read what she has done and her views on ministry. Get to know her better and you will see that she has betrayed no one at anytime. I will continue to champion her reputation even among those she has promised to protect and remove from the margins where the reasserters have put us. I urge you who would throw the first "stone" to consider what she has done in her life of ministry and the prospect of what she will accomplish for us in the future. This may be one singular step back but she will bring us that and more steps forward as she leads The Episcopal Church into a brighter future. Yes humor, that thing we do when we don't know what else to do besides pray a lot. And how about something to wear? Try cafepress apparel at http://www.cafepress.com/republicofdogs Some, not all, suggest you where to church...hmmm. There is one thing we can say for certain about our faith, our denomination, the thing we call ourselves as Episcopalians: we do not lack for looking at a not so great situation and making fun of it, with acerbic wit and creativity. In that area we there is no lack of talent! Keep praying and remember that our real hope yet remains unseen. Amen! My dahlias are finally blooming. I thought they were going to be pink but they are yellow with pink tinges on the tips of each petal...lovely. The roses, however, are not fairing so well. That is how it is with roses...you never know from one season to the next how they will bloom or fair, regardless of all of Martha Stewart's advice [which I tried to follow to the letter according to MS] or some swanky expert on the HGTV, like Paul James. So I have a few tiny blooms on the David Austin deep red rose and on the Double Delight. Oh well. The honeysuckle is running amuck over the back door so I must hack at it as if I were in some heavy-scented, intoxicating jungle. Once through this I look at the 40 plus year old red rhody and think it needs pruning back. The Eastern Redbud is doing much better this year with its deep burgundy glossy heart-shaped leaves. The lace-leaf ivy however is threatening everything so I must decide on what's to be done with that. The pokers are bloomed out, the irises are done, and the passion vine has a definite mind of its own. As for the apple tree, it has apples on it and seems healthy. The fig trees have outdone themselves by setting fruit early in the spring and keeping them through all the iffy weather. The raised bed veggie garden is literally zooming along with tomato vines bushy and green, laden with yellow blooms. I planted an heirloom Brandywine and your Joe-average Roma this year, one of each since it is just me nowadays. I also have zucchini blooming like crazy and it has already set its fruit and it is growing daily. I will harvest these and slice them in to thin slices and then plug in the dehydrator and have fresh, yummy zucchini to cook with this fall and winter. I have planted parsley for myself and the rabbits. I'd much rather dry my own parsley and then hand crumble it for garnish and cooking than purchase what is in the stores. And the parsley is a wonderful addition to the rabbits' diet. I did plant some asparagus corms but I don't see any signs of life as yet and may not until next year. That's ok. I am patient. I also transplanted the chives from a too small container into new digs by the asparagus corms. In among the vegetables I planted a few perennials like sea thrift, candytuft and a rudibeckia to attract bees for pollination. I may have to move them because the tomatoes are getting quite large and are tending to overshadow them all. We'll see. Our forecast weatherwise is for low triple digits. Today it is 93 degrees so far at 2:30 pm PDT. The Rogue Valley is at 1384 feet nestled between two mountain ranges. Where I attend church is in a higher elevation so they are a little cooler there when it is high heat down here. It is a dry heat, and I guess we should be thankful we are not in a perpetual state of damp as they are in other parts of the country. I watered everything this morning to prepare for the heat coming today and through the weekend, especially the container plants and trees. The new redone flower bed around the Leyland cypress out front is looking very good. The things I transplanted like the two varieties of oxalis are growing and the one variety is blooming. 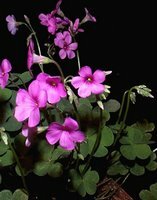 The wine-red leafed oxalis is a bit more sensitive so I may not be favored with blooms this year. Since the back of the bed is in shade most of the day, I have planted three varieties of fern. 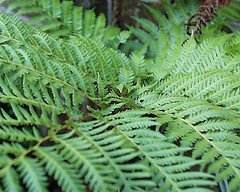 There is the Japanese silver leaf fern, a maiden hair fern and another green leafed one that I can't recall its name. In between these are some lithadora 'Grace Ward', and white and green coleus. Toward the front of the bed which receives both shade and sun during different parts of the day alternately, are the oxalia, coral bells 'Strawberry'", red begonias and vertical phlox. I have a clump of transplanted blue fescue grass which looks very good against the trunk of the tree. I have planted Shasta daisies starts in front of the tree next to the fescue as they will get about 3 feet tall eventually. The bed itself is raised and built of three tiers of cottage stone which gives it an aged look, especially when the moss sets in. All in all, my gardens have provided a much needed diversion from the last nine days' events, full of drama as they were in some instances. I think the drama in my gardens will be more than sufficient from here on out until fall. As my garden grows, I will share my little summer adventures as they occur. I pray every one a safe and joyful time of sun and fun. The House of Deputies had only 30 minutes to debate and discuss before voting. Some agree that if the vote had been taken after lunch, the outcome would have been very much different. My theory is that this particular issue was held until the very last moment, when the HD was the most exhausted, most worn down and then it was literally rammed through by the HB or at least part of them, and those in the HD that just wanted to be done regardless of the cost to anyone but themselves. I am only speculating because I was not there, but it is the sense that I get when reviewing all the notices, dispatches and bulletins. Next time this issue better be at the forefront and that we brook no delays in its determination. As for ++Katharine. Please do not judge her too harshly with this one situation. There is a strategy in hand and though we may not be very keen on it, we do need to get to Lambeth and have her presence made known, acknowledged, accepted and carried through so she may gain the necessary leverage back here to tame the radical right who would see our American church reduced to nothing but discriminatory, selective membership. So I urge you who are discouraged: we have gained a very powerful and progressive ally in ++Katharine. Let the Holy Spirit continue to work, though we may not understand it now, it will become clear later. As for those who feel abandoned, you are far from it. This is exactly how the other side wants us--helpless and abandoned, hoping we who believe in the full inclusion of all the baptized will skulk off to our little closets and stay there. Let me remind all who feel this way that we are to "hope for that which is unseen, not for that which is seen," because we already have that, and we can't let go of it. And it may be hard to fathom now, but "all things WILL work together for good, to those who are called according to His purpose," and we are called and will be there to answer it. There is much to hope for, my brothers and sisters, much. The Holy Spirit inspired the hearts of the bishops to bring us ++Katharine, and she will be God's instrument. Sometimes we have to take one step back to take three forward. I will reiterate: she must be invited, acknowledged and accepted at Lambeth in order to deliver a concrete message to the radical right and show the Communion that she cannot and will not be contained or "put in her place" according to their legalistic thinking. The God they worship is not the God or Christ or Holy Spirit that I know personally and that Scripture has revealed, and in who's Name I was baptized. As for the election of our new PB, it is truly a good time in life to be named Katharine, however it may be spelled. And as hers and my name come from the Greek, may the cleansing and purging of hatred, loathing, narrow-mindedness, poverty, homelessness be "cleansed and purged" as much as humanly possible under +Katharine's guidance. And she will guide us as the Spirit of God will her in leading us. She will need our prayers and support in every quarter to make her the most effective and enlightening PB we have ever had in our history. It is time to move forward and decide just how we are going to personally and individually fufill the mission of reconciliation in the Church [notice how unspecific I am??? ], and how what we do each day affects and reduces poverty, homelessness, conflict, war, genocide, helps those recovering from natural disasters, and the like. Let's try to reconcile these needs with what we can do to prevent and remedy them today. And it is our mission also to reconcile with our conservative brothers and sisters. They are listening whether is shows or not. Eventually we will get through to them. So there is much hope, as long as we continue to do the work of Christ every day and remember that there is "NO TURNING BACK!" from the course that has been set by the efforts ++Katharine Jefferts Schori, Rev. Susan Russell and Integrity, Michael Hopkins, Bishop Chane and the B033 Dissenters, and many, many others, who care deeply for all the baptized and will give no quarter until the work is accomplished and Christ's mandate for all the baptized is realized. I am simply amazed at the creative but destructively caustic words that come from those who are consciously bent on schism of The Episcopal Church and the Anglican Communion, AND who claim to consider themselves "doing God's will" in Christ's name. "the most traditional of the Anglo-Catholics do not believe that women can be ordained any more than horses can. 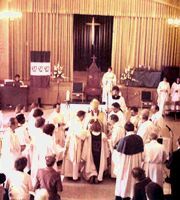 Just as we would not consider a horse ordained even if in some odd ceremony it had the prayers of the ordination service prayed over it, and hands laid on it, so an ordained woman is simply not ordained. So for the most traditional Anglo-Catholics we have just elected a very talented but equally misled, lay person as our next Presiding Bishop." "...how can a non-ordained person hold a position of such authority? For the evangelicals it shows that regardless of what The Episcopal Church may say it has no intention of changing course. For those who are trying to get us to toe the Lambeth line it may be experienced as another slap in the face. Once again, the Episcopal Church has moved faster than the rest of the Communion and has listened to the Holy Spirit more than to the councils of the Church. The Archbishop of Canterbury has sent a gracious message, but he notes that Schori's election will 'undoubtedly have an impact' and he must be wondering what in the world will happen next." To have the sheer nerve to compare legally, canonically ordained women clergy with animal nature of horses, is to insult women everywhere and their contribution to the church. Why is this? Because we are all "ordained" by virtue of Paul's words, that we are all part of the "priesthood" of Christ. Further, they called +Katharine Jefferts Schori a "talented but misled lay person". If they could only fathom that those who hold this opinion of our PB Elect, don't even qualify to stand in her shadow they are so vastly ignorant of what real intelligence, spiritual gifts, blessings and goodness truly is in Christ's Church. +Katharine is educated [unlike those who wrote the original article or hold those points of view], spiritual beyond the recognition of those who purport to know "the Truth", in tune with the Holy Spirit [that flame of Wisdom that Christ gave us to guide us as individuals as well as a community of believers; it is obvious that the wondrous seed of the Holy Spirit fall on all believers, but some ground is far more fertile than others], articulate and gracious [to me she is the calm in this doctrinal and petty storm stirred up by those who whine because they can't get their way], and she was the elected by our bishops and consented to by our deputies who felt the Holy Spirit move among them at Trinity Episcopal Church in downtown Columbus, and in the House of Deputies. It cannot be more clear that God has ordained +Katharine Jefferts Schori as the one to bring positive and enlightened change to our denomination, and most likely--in time--to the entire Anglican Communion. "...the Episcopal Church has moved faster than the rest of the Communion and has listened to the Holy Spirit more than to the councils of the Church." I would much rather listen to the Advocate, the Helper, the Holy Spirit that Jesus Christ gave us than to man-made doctrine that is in and of itself, flawed and inflexible. Man-made doctrine is just that, "man-made" because no women were ever permitted to influence the Scriptures though there are many beautiful examples of women in both Old and New Testaments that obviously show the key involvement of women in Christ's ministry. God, in His glorious will, has changed all that and has brought us to this positive and defining moment in our church. I am glad we are accused of listening to the Holy Spirit more than the "councils of the Church" because She is part of the Trinity, Father, Son and Holy Spirit. What better way to obtain wisdom for the course before us than to rely on the flawed, stilted, and unbending voices of David Anderson and Kendall Harmon. I am proud and yet humbled to have +Katharine as my future Presiding Bishop, the Anglican Communion's first woman Primate. Proud because she will lead us into an even better future than ++Frank has led us already, and humbled because the Holy Spirit moved among those who sought guidance to choose her, and so showed Herself to be truly and tangibly present to the rest of us. +Katharine will always outshine her critics and naysayers, including the "orthodox" women who have been duped by they narrow-minded male leaders in their little "orthodox" conclaves into believing what they say and do is right. "And God causes all things to work together for good, to those who love God and are called according to His purpose." +Katharine Jefferts Schori has been called according to His purpose because she truly loves God, and will endeavor with all of our support and prayers to make all the turmoil work together for good. Here you will find statements, interviews, testimony, speeches/homilies, as well as video that you can watch from last week and this week. The coverage by Kim Lawton, their senior correspondent, is clear and to the point, but truly fair and balanced, giving all a voice on the major issues. The footage of convention is up close and personal, but mostly without bias. So, if you need to review, this is one good place to go to do just that. "And may the peace of the Lord be always with you. The Rt. Rev. Katharine Jefferts-Schori, soon to be former Bishop of Nevada, is the newly elected Presiding Bishop of The Episcopal Church, USA. We in Oregon rejoice as she was an assistant rector in Corvallis, OR before she was elected Bishop of Nevada. We rejoice in this historic and progressive event! Amen! The following is part of an email from my dear brother in Christ, Will, who lives in the eastern part of the San Francisco Bay Area. He hopes that the poem he sent along touches me as much as it did him. My hope and prayer is that it also touches each of us on our journey, that we may receive it, that we may repent of any hurts committed against one another, and by so doing reconcile us to each other and ourselves to eventually come to restore health and wellbeing among us. "Today is Juneteenth ... that day when the Black citizens of Texas were informed that the Emancipation Proclamation had been signed (and as the black preacher I heard said, "I wish that the white people of Texas had ALSO been informed, because they needed to know it, too." and I hope it touches you as it did me when I read it. Will." Leaving behind nights of terror and fear I rise Into a daybreak that's wondrously clear I rise Bringing the gifts that my ancestors gave, I am the dream and the hope of the slave. There is an overwhelming amount of business going on at Convention in Columbus, and more coming up. This is only a tiny sample of what information can be had on the Internet regarding Convention. The LGBT issue is certainly not the only one being address either. The BCP is looking at possible future changes as soon as 2009 in Anaheim, CA where the 76th GC will take place. Issues of the Church's part in slavery is being revealed in a 40 minute documentary in Columbus this weekend. And that brings us to reconciliation and reparations for same. Also regarding the Prayer Book are issues of youth, cultures from around the world in the Communion, the altering of our European view of prayer to be more inclusive of other people and incorporating them into a prayer book for all, everywhere. And if it isn't enough that some of us are having a hard time getting along and communicating, there is a group of people outside of the Convention that make their views very clear. Their bigotry and hate has no place in Christian worship or Christian life. On the lighter side: And its as if we didn't need one more controversy, a new one has come up at this Convention: Jello. Both houses are split over red versus green, plain or chunky. No one knows if it will come to vote but the electronic machines are now working in the House of Deputies so we will have to wait for the outcome. But isn't it good to know and take comfort in the fact that God is so very present in the midst of it all, moving among all who are gathered there, those who love Him, those who don't, those who hate His people, those who are the Pharisees who enter the temple and say, "I am a righteous person, and therefore bless me!" and the one in perhaps less than the best of clothes, kneeling in a corner or before the main altar after everyone has left, whispering, "Lord I am not worthy. Please hear my prayer...". He is with us, perhaps more deeply seated within the hearts and conscious minds of His people, since this time last week when things had not yet begun. And so we continue to wait, and pray. We listen and we deliberate, desperately wanting to understand things that we will never truly comprehend, wishing and hoping we can change things enough to make not only our denomination a better family but to make the world a better place. Let's keep listening and praying, no matter how long it takes. We need to be the witness of God in the world. I think that is a mission we can all agree on. Nothing Is Impossible for God: So why do we still think it is? Deputies at work in committee. The grist has been added to the mill as of yesterday. The grain will get its grinding now, and how. I don't envy the winnowers their work, nor do I envy those heaving the baskets of grain to be threshed. How their shoulders must ache, and not only with the hard grain they bear, but also with the attitudes--or lack thereof--of those coming forth to dump their loads, graciously or otherwise. The winnowers and those working with the millstones have very long, ardrous days beginning at 7:00 am and usually ending around 10:00 pm or later. Then they sleep--we hope!-- and get up to do it all again in the morning. And so it goes. They probably have those little carts you use to move your luggage around at airports [the folding kind with two wheels] that they lug all their paperwork, reports, copies of resolutions, water bottles, little discreet pillboxes containing their headache or nausea tablets, and I wouldn't be surprised if a few had a pillow in there somewhere or an iPod. "No good thing will God withhold from those who walk with integrity." Some folks there deeply believe with all their hearts and souls that they know the will of God, that they know the "truth" of Scripture and its vast meaning, that their "truth" is the only truth that matters, and that anyone else's truth is wrong. Sounds very human. I suppose what gripes me the most are the voices that claim God is on "their side", that while LGBT members of the Church are baptized and loved by God, they are still less than human than the rest of us. 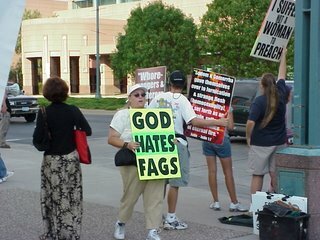 Nowhere does Jesus preach that--in the words of Desmond Tutu--He died for "some", that He died for this group or that. We know that He told us He died for us all, that all fall under His grace and love and acceptance. That no one who proclaims Him Lord and Savior and follows Him will be denied anything. Given this, who are some to say that the dignity of all persons should be withheld from some but not others? Those who would exclude the baptized from all the rights and privileges that Christ guarantees us, not some organized church denomination with all of its human-made rules and procedures. The one line of many in the newly released Voices of Witness is the one where someone telling their story says: "I don't want to belong to a church who will bless my dog but not me." I hope I am quoting this person right, but the gist is the same. We bless buildings, burial plots, heterosexual couples, pets but not those who have a right to it, our LGBT sisters and brothers IN Christ. What I rest in spiritually is that, regardless of the hoped for outcomes of this turning point in our Episcopal history by either ideology, God in all Her mystery and infinite Wisdom, will always do what is best for us in this microsecond of time by Her measure. And if we can remember that it was Paul who pointed out that "nothing is impossible for God", then we ought to rest assured that, indeed, it will come to pass. "Nothing [NOTHING! zip, zero, zilch, nada] is impossible [this word is not in God's vocabulary!] for God [Father, Son and Her, the Holy Spirit]. No matter what we do here on earth, we are not in charge. And to that I say, with all my heart, "Thanks be to God!" Can melt our tiny licks of truth into love. Grant us that sweet grace, Lord. By the certainty of our views. Mix sacred spittle in the mud of our desires. What if our opponents were right? Grant us the empathy of your lens, Lord. Came utter and eternal victory over death. Grant us your kingdom, Lord. Reprinted by permission. All Rights Reserved. Morgan Hunt@Oct. 2003. Morgan is a member of Trinity Episcopal Church, Ashland, Oregon. I think it is fairly amazing that the Episcopal Church in America has been challenging fundamentalism since 1789. I mean, think about. [Pausing to do the requested thinking....] OK! Pretty amazing, huh? And we are still at it today, more so than ever before. 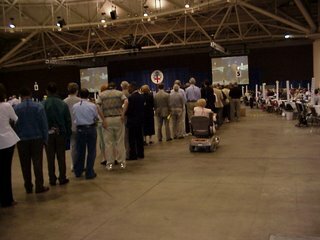 When you consider all that is coming to the threshing floor at the 75th General Convention in Columbus, Ohio, it can be fairly overwhelming, unless of course, you have been maintaining a rigorous reading schedule, have visited your opthamalogist frequently because your vision keeps changing [and our Vision does keep changing doesn't it? ], because everyone is bringing different kinds of "grain" to the floor for the triennial threshing, to winnow the sustaining grain from the bothersome chaff. And this grain, the grain which should be born of the fruit of the Spirit, unifying Grace, and unconditional Love, will eventually be ground down and kneaded, over and over by many different hands to hopefully create the bread of life for our spiritual sustenance and healing reconciliation with those who join us there, and with whom we actually have more in common than we do differences. This is not to minimize the critical and sensitive issues at hand facing all of us during this Convention. More so, it is to emphasize the need for setting aside narrow legalistic judgments and instead turn to the fulfillment of all that came before, and has been, and is unified in Christ: He who is the fulfillment of the Law, the unconditional love and acceptance of all the baptized in Him. This prayed for compromise, that does not relegate the burden of success or failure upon the shoulders of the currently excluded and the marginalized of the Church, namely our LGBT brothers and sisters in Christ. It is necessary to review our history as a church in these United States to realize that we are far from finishing our challenge to fundamentalism within our denomination. And as important as equality for the baptized is, we must also remember that there are other issues that beg our attention and should receive due treatment. If only our "Anglican orthodox" brethern would expend and reinvent their legalistic energy to the overcoming of poverty, discrimination, poor education, delayed rebuilding of the post-Katrina South, and reaching out to all as Christ bid us do, then the scapegoating and vilifying of our LGBT members would hopefully end as part of the overall mission. We need to pray, and diligently, for everyone: every deputy, every alternate, every bishop, every priest, every committee, every interest group, whether we agree with their views or not, because the time is now for unity, constancy and peace. Light a candle daily, burn incense so that our prayers for this General Convention will go up as the incense to God, pray the Episcopal rosary [I thank my priest/counselor friend in Maryland for bringing this blessing to me! ], meet together for the Octave of Prayer, send encouraging and hopefilled messages to your deputation that God's will shall be done, not ours in its finiteness. Love your neighbor, whether you agree with him or her, or not. Witness to the churched and unchurched that we can overcome our worldly differences as well as our opinions of God. Most of all, love the God who made us, and loves us and travels this potholed road with us in the coming days. Amen. "O God, we dedicate this threshing-floor to you. May all the grain that is threshed here be used to your glory alone. May your angels guard this place and these your servants who will here thresh the grain you have given. Grant that of all this precious grain none will be lost, but that all may be used to feed your hungry children. May all that eat it know that of your grace and love you give them bread in due season. May even the little birds of your creation who shall glean their food here be conscious of the heavenly Father's care, through Jesus Christ our Lord, who is the true Bread of Life come down from heaven. Amen." This prayer is from Christian villagers in India at the dedication of a threshing floor, but it is also used as a prayer for the purifying of the Church and its stewardship of the gifts of creation. I read several blogs a day and the bitterness and downright ugliness is a trifle hard to bear. The rage of the so-called "orthodox" right is more than palpable, it roils, spits and delves into the character assassination of the peacemakers, and there is no health in it. Not so surprisingly, the moderates and progressives are downright calm and firm in their stand for equal standing of all the Baptized. It is sorrowful for all I am sure to see the lines drawn in the sand. And here's the thing: it is the moderates and progressive side that is trying very hard to erase the lines so that division does not occur. When narrow-mindedness throws reason out of the window, there can be no understanding or common ground. It is all or nothing. No compromising. Makes you think that the "orthodox" are all ESFJ's, especially strong in the J for judgment category. I could go on and on but I won't. It serves no purpose to repeat myself. I know that which I believe and I will live my life, in spite of the hurling of "stones", epithets, and diatribes, to the glory of God, to the imitation of my Lord Christ and continually give the Holy Spirit free reign, so I may hear Her and know Her, and live by Her Wisdom, always. The following sermon was delivered by The Rev. Anne K. Bartlett, Rector of Trinity Episcopal Church, Ashland, Oregon. Rev. Anne is a clergy member of the Diocese of Oregon Deputation to the General Convention of the Episcopal Church USA, Columbus, Ohio. This sermon is reprinted with permission. "Come Holy Spirit, come. Come as the fire and burn. Come as the wind and cleanse. Convict, convert and consecrate our hearts, until we are wholly thine. Amen." Once upon a time – this is a true story...Once upon a time, back in the 1970’s,a mad scientist – well, he wasn’t really mad, he was just a little quirky, like most scientists, at least the scientists I know and love – Okay. I’d better begin again. Once upon a time back in the early 70’s a scientist rented a huge, empty building way out on Long Island. The building was actually left over from the World’s Fair of 1964 and had not yet been torn down or renovated or leased. The scientist’s area of study was the weather: specifically, whirlwinds. He wanted to do a controlled experiment in the confines of the big empty building, so he rented it for a day and brought in his equipment – monstrous fans, as I recall, and he set them up in strategic spots to create his mini-tornado. The moment came. He turned on the fans. He felt the air move. But he couldn’tsee a doggone thing. There might have been a host of whirlwinds twirling all over the vast expanse of the building, but the whacky scientist forgot that air is invisible. We see the effects of wind -- the rustling of tree leaves, the bending of grass, the filling of sails on a boat, the turning of a windmill’s blades, the destruction of a city – but we do not see the wind itself. Here's my point. Today is Pentecost, the feast day of the Holy Spirit. I want to scatter from this pulpit a fistful of brightly-colored images of the Holy Spirit, images from Scripture and tradition, to sparkle here among us, so that together we might perceive how God the Holy Spirit moves among us, whether we see Her or not. Our older brothers and sisters in the Jewish faith called the Spirit Wisdom, who was present at the creation and active in it. She is honored in the Book of Proverbs, personified as the wise woman who teaches her children in ways that give life and keep us on the path to God. She shows up as the Shekinah, the visible manifestation of God’s glory that lights up creation itself and announces the Presence of the Divine. The Greek word for the Holy Spirit is pneuma, meaning: spirit; or, breath; or, wind, the air itself, as multi-layered, multi-valent as the Hebrew. Think: numinous. Think: pneumatic drill. Ah, sometimes that’s how She works on us, is it not? When God comes to us as Spirit, the action is not always soft and gentle. Her comforting caress may alternate with a pneumatic drilling of our souls, to heal us or at the very least to capture our attention. Don’t put the Spirit in a box or in a corner. She simply won’t stay there. That is not God’s way. She will not be managed. Jesus called the Holy Spirit the Comforter, the Counselor, the Advocate, the Spirit of Truth. Those are some of Her other names. At his baptism, the Spirit descended “like a dove” (that’s a metaphor) and then drove Jesus into the wilderness so that He might learn who He was and how He was to be. So we can add Dove and Driver to our growing list of names. 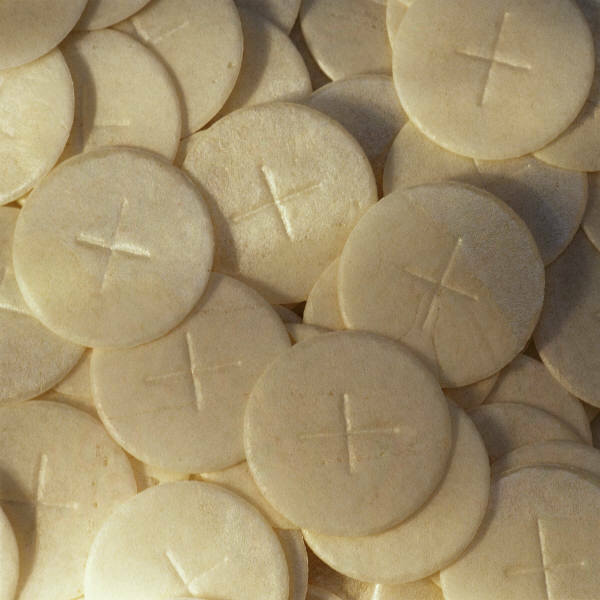 In every Eucharistic prayer we ask the Holy Spirit to sanctify the bread and wine to make them holy, so that in the mystery of the Eucharist we may experience Christ Himself, with us, among us, here with us, as close as our own breath. And then we ask the Spirit to sanctify us as well – to make us holy. We invite the Spirit in, inside of us, to do Her work of making us whole and alive. So the Spirit is the Sanctifier, making whole, making holy, making us one with Christ, making us Christ’s own Body. Just like the invisible whirlwind, the Spirit, we say, is ever present, though usually invisible to our human eyes and hearts. She works deep within us whether we are aware of it or not. Often it is only the effects of Her work that we perceive in our lives, the fruits of gentleness, self-control, compassion, courage, patience. "Likewise the Spirit helps us in our weakness; for we do not know how to pray aswe ought, but that very Spirit intercedes with sighs too deep for words. And God, who searches the heart, knows what is the mind of the Spirit, because the Spirit intercedes for the saints according to the will of God." Think of that! Take it in! The Holy Spirit is praying for you, praying in you,bidden or not unbidden, felt or not felt, doing her healing work of reconciliation, whetherwe are aware of it or not. 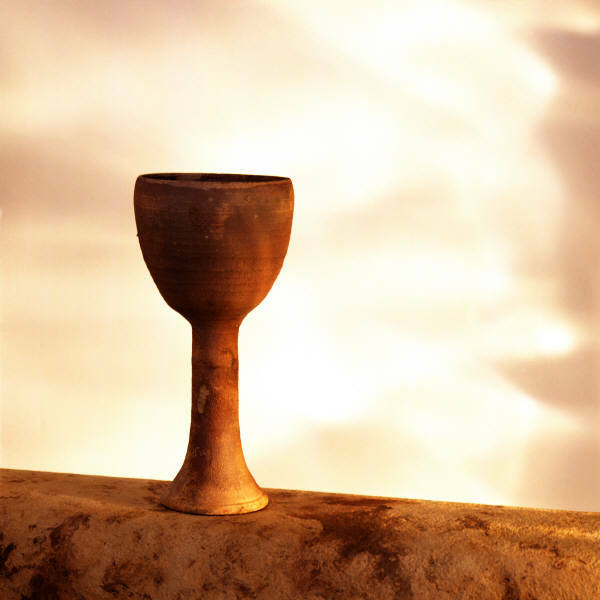 In the ancient Nicene Creed we describe the Holy Spirit as the “Giver of life.”The Breath of God breathes in us, gives us life, brings us new life when we’ve managed become as dry as a dried up prune or a field full of old dry bones; (the field of bones image is from Ezekiel; the dried-up prune image is from me). The Holy Spirit gives us life. Gives us life! She breathes in us, guides and comforts us, teaches us, makes us holy, intercedes for us, gives us life and brings us back to life...oh, and one more thing: She also sets us on fire. Come, Holy Spirit. Come as the fire and burn. I suppose it is a good thing thatthe whacky ‘70’s scientist on Long Island was working with air instead of fire. God knows what he might have started. 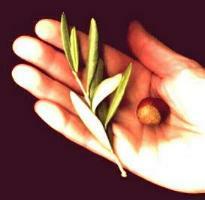 On this day of Pentecost, our normative story – don’t you love that word? I do; our normative story, the one we say tells the mystery best, even though it’s still, of course, inadequate because it’s a story told in human language, and human language, even with the most brilliant of metaphors, can never capture God, because God will not be managed by the likes of us, will not be captured in our language, but we still do the best we can...But I digress. Peace. Into our sadness and fear comes Christ with his peace. And then He breathed on them and gave to them the Holy Spirit, as we have been given Her, the breath of life, the gift of grace and power of reconciliation, that we might reconcile with each other and the world to God. Then the disciples were told to wait. So there they were, no longer afraid, all together in that upper room, the windows now open wide, saying their prayers when, as Luke tells the untellable, there came a sound like...like the rush of a violent wind which filled the whole house. And then...and then little lights began to appear, to flicker over each of their heads – there was one above Peter’s head and Mary Magdalene’s, also one for Andrew, John, Susanna, all of them – flames like fire, divided like tongues. And then the followers of Jesus began to speak in languages they didn’t know they knew – it was the Tower of Babel in reverse! Filled to overflowing with the Holy Sprit they poured down the stairs, out the door, into the street, talking in their newfound linguistic skills, telling strangers that they too are beloved children of the God who is ever creating life out of death, even at nine am on a summer Sunday. Because the Spirit is our Mother who has made us one in Christ, we are siblings. And as siblings we share similar but hardly identical spiritual DNA. We have been given different abilities, capacities, “gifts of the Spirit.” Some of us here are born listeners, counselors, spiritual directors who can listen to the stories of our lives and help us find God’s presence in them. Some of us here are skilled with our hands and so we do the work of our hearts by primarily using our kinesthetic gifts – cooking, cleaning, serving, repairing, folding, driving, nursing, doing. Some of us have the gifts of teaching, preaching, praying, pastoral care. Others have the gift of being with our children, and others the gift of hospitality, of welcoming the stranger; and others the gift of music to help us worship, and others the gifts of leadership, of seeing the hand of God at work among us, and discerning how the Spirit may be nudging us here at Trinity. Wind. Breath. Flames. Fire. Like a dove descending. Giver of Gifts. Intercessor. Mother. Comforter. Pneumatic drill. Wisdom. Restorer of dry bones. Dancing whirlwind of light and life. Come, Holy Spirit come. Come and give us hope. Surprise us with your grace. Heal us. Unify us. Empower us. Be with your Church this day, for we sorely need your guidance and your wisdom, we need to remember we belong to you and therefore to each other. Come Holy Spirit, come: convert, convict and consecrate us, until we are wholly Thine. The deputation from the Diocese of Oregon also includes from southern Oregon, Anne McCollum, a member of the church laity at Trinity South. Our deputation is led by The Rt. Rev. Johnncy Itticy, Bishop of Oregon. We wish them Godspeed, travelling mercies, good health and well-being while witnessing Christ's grace, joy and love to all with whom they come into contact while at convention, and, all the benefits of fellowship and communion with our sisters and brothers in Christ. We will miss them but know they will return to us, tired but happy. We will keep the "home fires burning" [the barbeques, tiki torches, citronella candles] in their absence. Happy trails, y'all! The room is crowded, smiles all around. Knowing you don’t feel a part them. You know it, see it, feel it on your face. Perhaps hold you briefly, assuring you. Inside you weep bitter tears and keen. Once our way is gone? This poem was submitted to Catherine+ by GardenerGal aka Name Withheld. May 2006.